Welcome to the Ash Class blog! : Night Zookeeper 100wc entries! We loved doing the Night Zookeeper 100wc this morning and have created some wonderful creatures for the zoo! I've chosen lots of our work for the 100wc this week, so you'll have to do me a big favour and make sure that you go out and comment on other children's work! Click on their names to read about their fantastic animals. 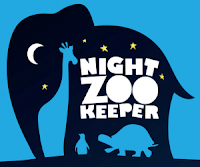 For more information on the Night Zookeeper, either click on the logo above or click here. Mr Kenyon, on my computer it says you have written, 'oo keeper' But is it ment to be 'zoo keeper'? Its probly just my computer.